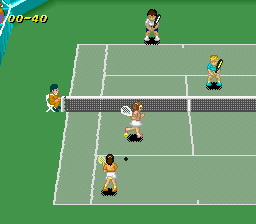 Super Tennis is a sports game that was a launch title for the SNES in Europe. It supports 1-2 players and the modes on offer are Singles, Doubles (can be played with a friend, or a CPU teammate if required) and Circuit. The latter mode consists of eight tournaments and your objective is to rack up points and gain the highest possible seeding by season end; however, your player can tire, so strategy is required when deciding whether to enter a tournament or get some rest. The options are plentiful, including three court types (Hard, Lawn and Clay) and 20 players (10 male, 10 female). The gameplay is very accessible with a fair difficulty level for newcomers, but a deep shot selection for pros that includes Top Spin, Lob and Slice. Controlling exactly where the ball will travel from a horizontal and vertical standpoint is a breeze, and there's even fun advanced options, such as adding spin to each serve. Co-op with a friend is the best way to experience the game, but it's still enjoyable advancing through the Circuit with a CPU team-mate, as the A.I. is smart and reliable. Opponents have varying styles (e.g. some frequently rush the net, while others rely on power serves / strokes) which forces you to adapt your strategy in each match. Likewise, rather than being simple palette swaps, the Hard, Lawn and Clay courts play very differently to each other (in terms of how the ball bounces) and changing your style to suit the setting and opponent is one of the game's best aspects. There's lots of memorable jingles and the action oozes personality, with players reacting with speech bubbles throughout depending on the outcome of a point (e.g. "Yeah!" or "Rats!"). Super Tennis is one of the finest sports titles of the 16-bit era and it's top-notch gameplay still manages to shine. Everything from the responsive controls and intricate shot selection is first-class, and it comes highly recommended, especially if you enjoy Arcade-style sports games like Virtua Tennis (2000, Sega Dreamcast). Random trivia: The two other SNES games available for the European launch were F-Zero and Super Mario World.